As 2015 dawned, a new musical partnership prepared to release their debut album. This new partnership featured two experienced, talented and pioneering musicians, who were, and still are, among the leading lights of Germany’s thriving music scene. Stefan Schneider was based in Düsseldorf, while Sven Kacirek called Hamburg home. While both of these cities have vibrant music scenes, the inspiration for their debut album came after Stefan Schneider and Sven Kacirek made several journeys to Kenya. After they returned home for the final time, the pair started discussing collaborating on a new musical project that drew on their experiences in Kenya. That day, the Schneider Kacirek partnership was born. Drawing on their experiences in Kenya, Schneider Kacirek decided to record an album were they interpreted Kenyan music using just drums, percussion and analogue synths. The pair agreed that no samples would be used during the project. With the ground rules in place, Schneider Kacirek began work on what was ambitious, but fascinating project. Eventually, after a lot of hard work, Schneider Kacirek had completed what became their debut album, Shadow Documents. It was released to widespread critical acclaim by Bureau B on the ‘1st’ of January 2015. Shadow Documents was hailed as an evocative, emotive and authentic interpretation of Kenyan music. All of the Schneider Kacirek partnership’s hard work had paid off. Especially after the album found favour with critics and music lovers. They wondered when Schneider Kacirek would return with a followup? However, they’ve had to be patient. Since the release of Shadow Documents in January 2015, Stefan Schneider and Sven Kacirek have been involved in a variety of projects. One of them came to fruition on November 2015. This was Sven Kacirek’s solo album, Songs From Okinawa, which received plaudits and praise upon its release. Meanwhile, Stefan Schneider was involved with a variety of projects, including running his own label, TAL. It had already released seven albums, including Stefan’s collaboration with pioneering visual artist Katharina Grosse. Their eponymous debut album, Katharina Grosse and Stefan Schneider was released to critical acclaim earlier in 2017. By then, the Schneider Kacirek partnership had been reunited. Stefan Schneider and Sven Kacirek hadn’t reunited to record an album though. That was still to come. Before that, Stefan Schneider and Sven Kacirek headed out on tour, and played live with a variety of different musicians. This included John McEntire of Tortoise and The Sea and Cake. For Stefan Schneider and Sven Kacirek the chance to play live was part of what is a never-ending learning process for most musicians. By playing together live, this shaped and influenced how Stefan Schneider and Sven Kacirek interacted as musicians. This was something that would shape their sophomore album Radius Walk, which will be released by the Hamburg-based Bureau B label on the ‘7th’ of May 2017. Recording of Radius Walk took place at Sven Kacirek’s studio in Hamburg. Stefan played vibes and took charge of the all important electronics. Meanwhile, Sven played shakers, marimba and drums, which would play an important part on Radius Walk. So much so, that Sven’s studio was setup in such a way that it captured the energy of the drums as they combine with a variety of traditional instruments and vintage analogue synths. They feature on all the tracks. However, award-winning Swedish singer Sofia Jernberg features on just three tracks, Dust, i Atlanten and Smiling. The addition of Sofia Jernberg is something of a coup, as her vocal talents are much in demand. She’s an experimental singer who studied at the Gotland School of Music Composition. By 2007, Sofia Jernberg was leading then chamber jazz group Paavo with pianist Cecilia Persson. Paavo released their eponymous debut album in 2007, and a year later, in 2008, Sonia received the Royal Swedish Academy of Music award. Sofia Jernberg’s star was already on the ascendancy. Since then, Sonia’s worked as a vocalist and composer on a variety of projects ranging from the contemporary classical music scene to jazz and experimental music. Sonia collaborated on the album Crochet with Lene Grenage in 2009, and has featured on the Fire! Orchestra’s albums Exit in 2013 and Enter in 2014. 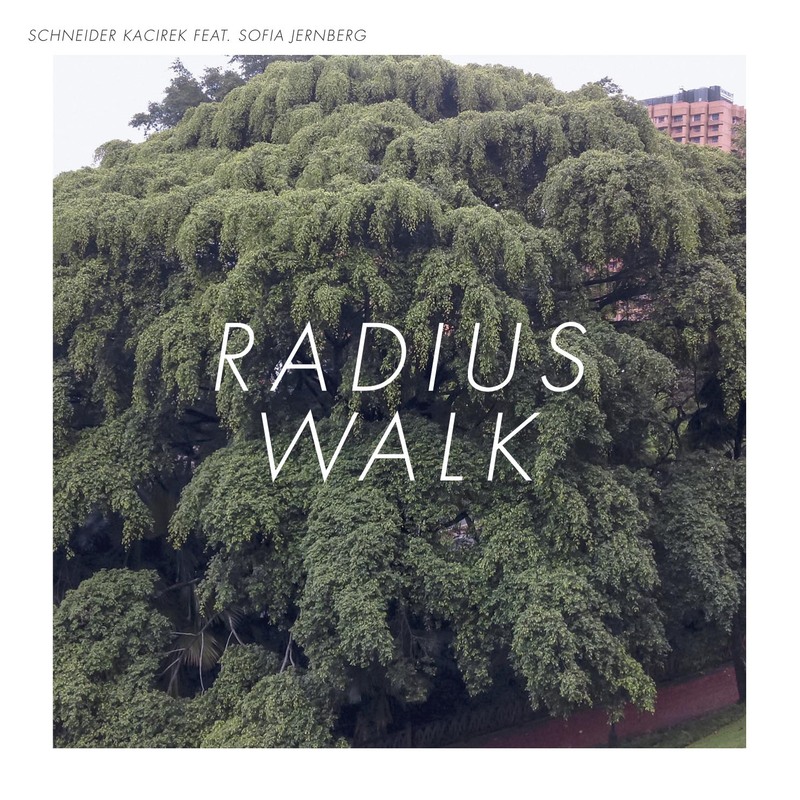 However, one of Sonia’s most recent projects is Radius Walk, which marks the welcome return of Schneider Kacirek after two-and-a-half years. As Dust opens Radius Walk is Dust, Sofia’s ethereal, cooing vocal sits atop the arrangement. At first it’s understated, before growing in power, drama and intensity. Hypnotic drums crack, while synths scamper, beep and squeak, combining with shakers as Sofia delivers a tender, breathy vocal. Sometimes she improvises, and her voice becomes an additional instrument. Meanwhile, a myriad of otherworldly, sci-fi and futuristic sounds flit in and out, playing an important part in the soundscape, Later, mesmeric drums still crack and pound, while shakers provide a contrast. So does Sonia’s tender and emotive vocal. It’s part of a captivating, multilayered soundscape that gradually reveals a mixture of drama, beauty and intensity. A squelchy, pulsating bass synths opens Duett while drums, pans and electronics are added. Soon, the pans reverberate, as crackling sounds join the pulsating bass synth that dominates the soundscape. Gradually, it decides to reveals its secrets, as a melodic, lo-fi, retro synth solo winds its way across the soundscape as hi-hats hiss. By then, the soundscape has taken on a robotic sound and there’s a Kraftwerk influence. Later, the new additions join the pulsating, growling bass synth, and latterly, shimmering vibes. This proves a potent and heady brew that is truly memorable. This is a result of Schneider Kacirek combining elements of music’s past and present, to create the music of the future. i Atlanten has an understated sound as washes of synths ebb and flow, like waves breaking on a deserved beach. Meanwhile, a mesmeric sound provides the soundscape’s heartbeat. As it pulsates, hi-hats hiss, Sonia add another tender, thoughtful vocal. When her vocal drops out, the gap is filled by Schneider Kacirek who add a myriad of disparate sounds. This ranges from cracks and crackling electronic sounds to drones, drums and strings being plucked. This alternative orchestra provides the perfect accompaniment to Sonia when she returns. Her vocal is emotive, and sometimes, she follows in Schneider Kacirek’s footsteps by improvising. In doing so, she plays her part in a beautiful, mesmeric and innovative genre-melting soundscape, that combines elements of avant-garde, Berlin School, electronica, experimental, folk and improv. Traditional and technology are combined effectively on Arbeit 16. A synth briefly oscillates, as a marimba and vibes combine. Soon, synths interject and drone, before adding sci-fi sounds. This provides a contrast to the marimba and vibes. They’re joined by a pulsating bass synth and a drone, as the man machine makes his presence felt. This is a synths that in what sounds as if it’s speaking in an otherworldly language. It’s replicated by the vibes, while the ominous sound of the drone and bass synth prowl across the soundscape. Meanwhile, a myriad of sounds, including beeps, speaks and cracks join strings that are plucked. Still the dark, moody sound of the drone and bass synth remain, while shimmering vibes and drums adds a contrast. They play their part in a hypnotic, haunting, cinematic soundscape that is one of Schneider Kacirek finest moments on Radius Walk. There’s also a cinematic sound on Back, as what sounds like a small aircraft soar high into the sky. This is the start of a cinematic journey, as this minimalist and mesmeric soundscape starts to reveals it secrets. It features layers of synths, that drone, crackle and pulsate. They’re joined by drums, cymbals, shakers and plucked strings. These are all parts of Schneider Kacirek’s musical pallet. They use it wisely to create an epic cinematic musical journey that gradually reveals its secrets. Back veers between minimalist and mesmeric, to blissful, dramatic and futuristic as it continually captivates and thought-provoking. Lumpur has an understated sound before it reveals its secrets. Crackling, bristling and futuristic sounds join beeps and squeaks, before drums and vibes join this alternative orchestra creates. By then, elements of avant-garde, electronica, experimental and post rock are being combined by Schneider Kacirek. Soon, drums rolls joined the eerie vibes and otherworldly sound that flit in and out. Later, drums crack and add a degree of urgency, before the arrangement ebbs and flows before dissipating. All that remains is the memory of another innovative soundscape from the musical pioneers, Schneider Kacirek. Given the title Drums Drums, most people would expect drums play an important part in the soundscape. They do, to some extent. However, so do a variety of synths. This ranges from sci-fi synth that weave across the soundscape to shrill synth strings. They’re soon joined by a snarling bass synth that joins with the synth strings. Meanwhile, drums crack, while layers of synths wind their way across the soundscape. Some oscillate, while others rise and fall and with the drums create a futuristic soundscape that features Schneider Kacirek at their innovative best. Smiling closes Radius Walk, and features the return of vocalist Sonia Jernberg. Before that, washes of droning and probing synths join with drums in providing a backdrop for Sonia’s improvised vocal. There’s an element of drama and theatre, as his her vocal weaves in and out, as she instructs Schneider Kacirek. When her vocal drops out, just drums and oscillating synths sit atop the drone. Then when Sonia returns, he vocal is much higher, as it become a de facto instrument. Meanwhile, a myriad of futuristic sound and drums that crack accompany Sonia. All too soon, Sonia’s vocal drops out, and another inventive and captivating soundscape dissipates. This brings to an end Radius Walk. After a two-and-a-half year wait, Schneider Kacirek make a very welcome return with their sophomore album Radius Walk. It’s another album of groundbreaking and genre-melting soundscapes from two of the leading lights of the German music scene. 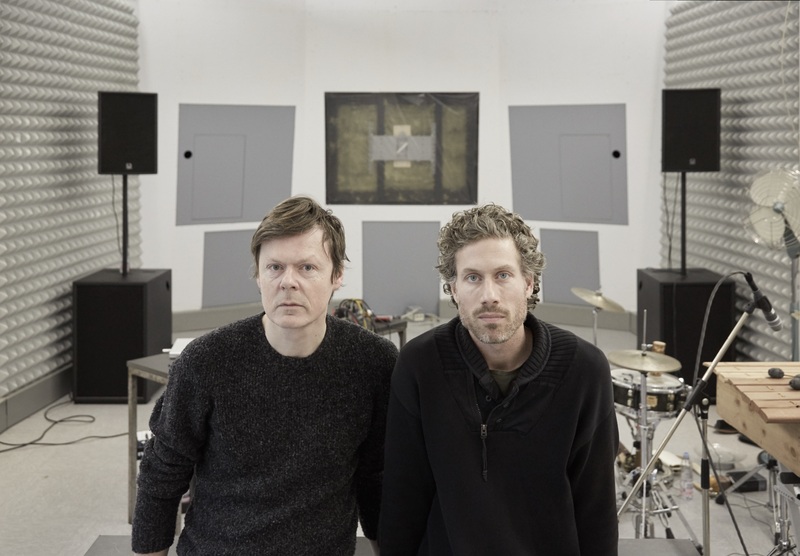 To create Radius Walk, they entered Sven Kacirek’s Hamburg studio, and combined elements of ambient, avant-garde, electronica, experimental, folk, improv, Krautrock and post rock. The influence of both the Berlin and Düsseldorf Schools of Electronic music can also be heard throughout Radius Walk. It’s an ambitious and innovative album, which finds Schneider Kacirek pushing musical boundaries to their limits, and sometimes, way beyond on Radius Walk, which is a fitting followup to their 2015 debut album Shadow Documents. The two musical pioneers were joined by Sonia Jernberg on three of the eight soundscapes on Shadow Documents. Sonia Jernberg’s addition was something of a masterstroke, as she’s a truly talented singer who has honed her own inimitable style. It’s showcased on a trio of soundscapes on Radius Walk. Sometimes her vocals are tender, ethereal and heartfelt, while other times, Sonia improvises, and her vocal is transformed into a de facto instrument as it weaves in and out of the soundscape. It plays its part on the sound and success of Radius Walk, along with Schneider Kacirek’s fusion of traditional instruments and technology. They’re all part of Schneider Kacirek’s extensive musical palette that painted the eight soundscapes that became Radius Walk, which will be released by Bureau B on ‘7th’ July 2017. Radius Walk is no ordinary album, and features inventive and captivating soundscapes. They veer between cerebral, thoughtful, thought-provoking and ruminative soundscapes to dark and dramatic, to minimalist and understated, right through to beautiful and blissful, to haunting, hypnotic and mesmeric. Other times, they’re understated and subtle, with Schneider Kacirek taking a less is more approach. So does when the soundscapes feature a myriad of futuristic, sci-fi and otherworldly sounds. They’re part of Radius Walk’s captivating and compelling cinematic sound, that is guaranteed to set the imagination racing during what’s akin to musical voyage of discovery, which is full of twists and turns, and subtleties and surprises aplenty. ← PLAYBACK RECORDS-THE STORY SO FAR.